"We don't want people going out to buy guns and using them to kill people," said Fernandez. "But we do need to realize that lawfully licensed gun owners have the right to defend themselves." That is a sentiment half of all Floridians agree with, according to an October research study complied by the University of South Florida in the wake of the Las Vegas and Pulse shooting massacres. Organizers expressed their condolences on the shooting, which has reignited the national conversation on gun control legislation. "There’s no disrespect or insensitivity intended by this long-planned gun show,” a statement from organizers said. The deadly shooting in Parkland has at least one gun vendor outraged at the systemic flaws that allowed Cruz to get an AR-15. "The government needs to do its job and they dropped the bomb and it’s pretty freaking sad," said Keith Moroe owner of Pompano Gun and Pawn. "You're damn right, I'm scared everyday. It could have been my children, my grandchildren." In Florida, described as one of the weakest states when it comes to gun restrictions, you must to be 18 buy a rifle, but 21 to buy an actual handgun. That fact is a glaring problem, which some outraged residents say needs to be addressed. While there may be a climate shift on the gun debate in some parts of South Florida, there’s no sign of a shift at all at the Florida guns expo at the Miami Dade Fairgrounds, which drew hundreds of gun enthusiasts across the state. Despite heavy criticism on the timing of this event and heated remarks on social media, no protesters appeared to be at the event. 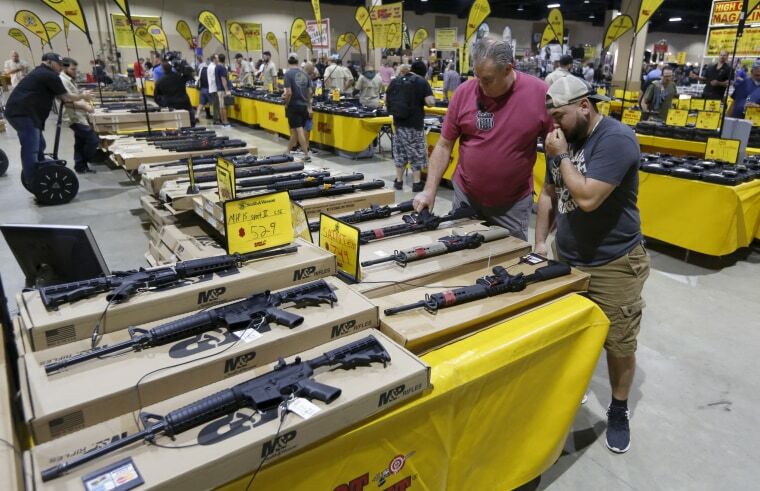 The conversation at the gun show often turn to the AR-15, which is one of the nation's most popular guns and has an average price of less than a thousand dollars. David Bustillos, a serviceman in the National Guard, went to the expo to help his friend get a fair deal on the AR-15 before prices skyrocket. Georgia native Eric Willis is new to Florida. "I don’t disagree with the gun law," he said while standing outside of the closed Sunrise Tactical and Ammo, the store where the shooting suspect purchased his weapon. "People should be able to protect themselves." "In the state of Florida, if you have the money, you can get a gun," he added. Guns rights enthusiasts at the expo are largely pointing to the flaws by the FBI and the Broward County Schools for not acting on leads they may have had on the shooter months ago. "Is there way to fix this?" said Moroe. "Follow through with your job. Get the job done."